A painless online application solution for your applicants and admins to love! Get Your Process Reviewed Free! Let your applicants complete your application form on-line, upload supporting documentation, save progress and return later if necessary, submit and track processing progress via a secure student login area which comes with an instant messaging system direct to your admin team should they have any questions. Easily manage staff access, programme listings, shortlist applicants, capture reviews from internal or external members of your team, send out automated emails and communicate with your applicants from within the platform private messaging system. We work with you to capture & understand your current process, really focusing on extracting your main pain points whilst retaining critical aspects of your existing work-flow. We setup your on-line capture forms, configure and embed your work-flow into our ‘out of the box’ admissions solution and have you up and running in days. We support you post launch with weekly reviews and give you access to additional functionality in the form of ready developed plug-in apps should you require them. 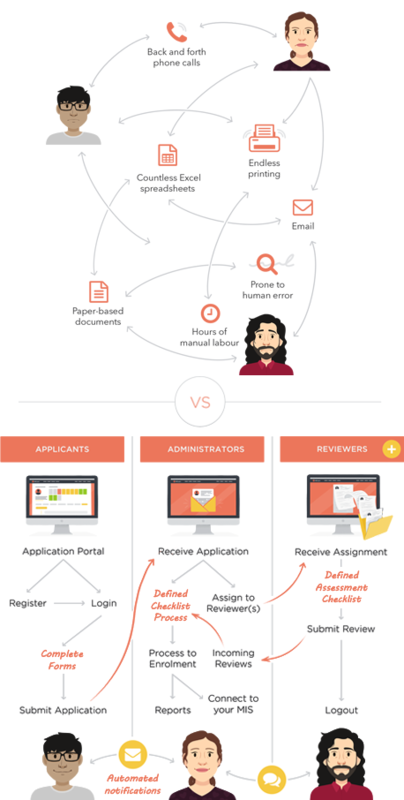 We had a paper-based application process with internal and external team members. It was proving time consuming and difficult. Email trails were hard to follow and find and we were constantly fielding applicant follow up calls. HEIapply has allowed us to have a complete on-line application process, massively improving the applicant journey. We were using another platform that was not fit for purpose until we discovered HEIapply. We had a short time-frame in which to turnaround the project and we managed to get up and running very quickly. Allows applicants to register/login, complete an application, upload supporting documentation and submit for processing. Within their portal they can view assigned applications, review & comment against them. Over the years we have helped multiple organisations, businesses and institutions in various sectors. As a result we have developed industry specific solutions.